For a recent production of 'Much Ado About Nothing', the director requested a tray of simple canapes. I decided to go with a cheese spread on bread garnished with vegetables. Some were fake and some were consumed. I wanted to seal the bread that was not going to be eaten, so I let it dry out over night then sprayed it with four coats, or so, of matte acrylic spray. As a warning, the bread did shrink and warp a little when it dried so it’s probably not a good idea for close distances. 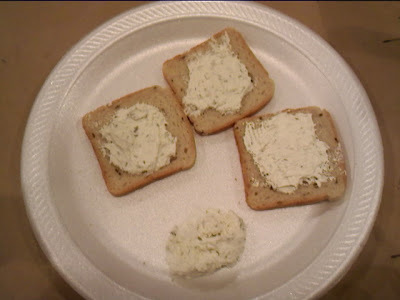 Next, I spread some cheese on two pieces of bread and enjoyed a snack while analyzing the cheese for color and texture. I put some caulk in an appropriate mixing container and added just a little bit of the yellow ochre tint. I guess it was my lucky day because I was able to match the color without adding too much tint. 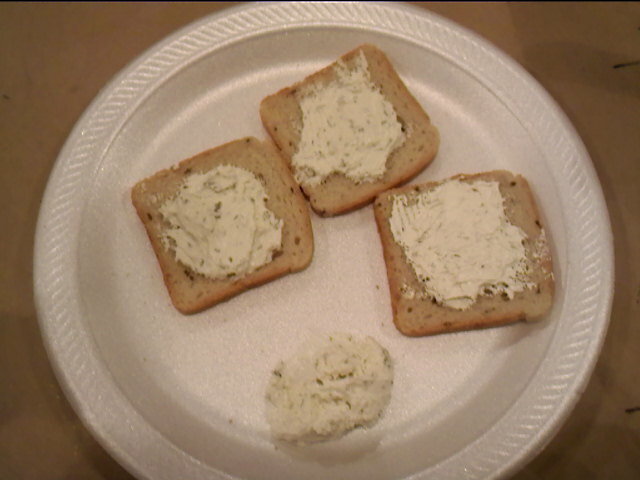 To simulate the herbs in the cheese spread I liberally added some dried oregano to the gourmet caulk mix. The oregano helped with texture, but was not visible as herbs in the cheese. So, after spreading some caulk mixture onto the bread I sprinkled more oregano on top and mixed it just enough to lightly coat the oregano in caulk but so the green color still showed. After the caulk cured I sprayed a little bit of satin acrylic spray over it to give it a little gloss. Left to right, the first 2 pieces of bread are real cheese and the third is caulk. For the show all of the canapes were dressed with shreds of real carrots or cucumbers, which were (obviously) replaced each night on the fake canapes. So, propsters, do you have a lovely food project that you would like featured on the blog? Send it on over to propsanna@gmail.com along with photos and an explanation of your process. If I like what you sent, I'll put it on the blog. Happy propping!